Will binning £1k rubbish fines impact recycling rates? Controversial ‘bin fines’ for people who put their rubbish out incorrectly are facing the scrap heap under new plans. A victory for common sense, or damaging to recycling rates? Hands up if you’ve ever put your rubbish out on the wrong day, got your wheelie bins muddled up or accidentally put the wrong type of plastic in the recycling? Sounds innocent enough – but it could have cost you dearly if your minor misdemeanour happened to come to the attention of your local council. In England, you can be issued with a fixed penalty notice of up to £110 for that sort of innocuous mistake. Councils can also push for ‘offenders’ to be given higher fines of up to £1,000 – and even a criminal conviction. Now it looks like bin fines are headed for the landfill site in the sky. Under proposed changes set out in a government consultation, councils will only be able to issue a fine if they can prove that a resident’s actions are causing harm to the local community. While many of us may have heard about local cases of the ‘bin police’ at work, I was certainly surprised to hear that almost 5,000 fixed penalty notices have been issued in the past year – worth a collective £215,955 – according to figures from the Sunday Telegraph. It sounds like sense has prevailed – but councils argue that bin fines were only ever given out as an ‘absolute last resort’ in cases of nuisance neighbours. Bin fines were brought in to make people dispose of their rubbish more responsibly – so will the change make any difference to how much people recycle? Apart from unnecessarily panicking people on bin day, the threat of a fine was never going to stop people making one-off mistakes. And it feels a bit off-target when considering the bigger barriers to better recycling rates – some of the complex and poorly communicated recycling services out there, for one. Having said that, if my local council had spotted my neighbour’s consistent inability to put rubbish into the bin (rather than piled next to it) perhaps I’d now be living next to a model recycler. There’s no easy answer, but with squeezed council budgets, landfill tax rising and recycling targets being beefed up, getting more people to recycle remains on the agenda. Do you think penalising people who don’t dispose of their rubbish properly is a good way of championing more recycling and less wastage? Or will you be glad to see the back of bin fines – and have you ever been faced with one? 2 problems here: Firstly, the huge complication and variation between different local authorities. Do they take tetrapaks? Which sorts of plastic? (Hands up who really understands all the different types) Secondly, plain belligerence from some people or at least lack of sufficient time and perhaps intelligence to sort it properly. What to do? I don’t know, but surely fines are not the answer. Fining households isn’t the way to improve recycling. On more than one occasion I’ve seen people walking down my road trying to put their rubbish in any recycling bin that wasn’t full. Fining individual council members is the way to improve recycling rates. I asked my council about all the plastic they don’t take and I’m still waiting 2 years on for them to ring neighbouring councils (who do recycle more plastic) who do to find out what they do with it. So every other week my rubbish bin is still full of plastic as the council only take plastic bottles. And don’t get me started on the bin men not emptying bins cos they’re open by an inch and not closed. And what’s with the trail of rubbish they leave behind themselves. We need a common standard for recycling and to help people understand what goes into each bin. It’s no good if this varies from council to council. When staying with friends recently, I was amazed to find that glass should not be put in the recycling bin but taken to a recycling facility just outside the village. I am still not sure which plastics to put in my own blue bin and it would be a great help if my council would make this clear– after all, plastics are coded by number. 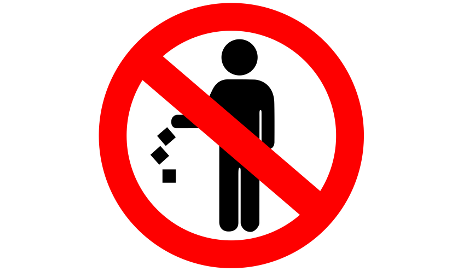 I do not put wet/dirty paper or cooking oil bottles in the recycling bin. The former would contaminate clean materials and cleaning oil bottles wastes a lot of hot water and detergent. If I am told that I’m making a mistake then I will endeavour to do better in future. Fines should be reserved for the persistent offender and perhaps it would be better to reward those who do put in effort at recycling with a small token of appreciation. The Government are in a political pickle. They’re currying favour right left and centre and petrified they will lose votes. They are also being heavily lobbied by the producers of all that packaging we’re all fed up with having to dispose of – let alone sorting first. The LAs are left with the bill for disposing of it and the consumer (who didn’t ask for it but gained it through the inertia of not complaining or complaining loudly enough) gets passed that bill in Council Tax. A lot of this packaging is avoidable and/or unnecessary. Whereas some Councils seem on occasion to go over the top – and don’t the papers love that; there are still people who are not doing ANY recycling and leaving a terrible mess on our streets attracting vermin and not taking any responsibility for their own waste. In some areas people are throwing their waste out of windows into the street. The Government should be supporting the LAs in getting the message out that just as they don’t expect to buy everything the same in any shop they shouldn’t expect to recycle everything the same in any LAs’ collections. They have different contracts with different recycling companies providing different services – and these change as processes evolve and facilities are built. WE need to be keeping abreast of our own LA’s contracts so that we know what we can recycle and the LAs need to make sure that they put the information out on their website, on Recycle Now, in Council literature issued and banners/posters so that it is EASILY ACCESSIBLE. Some LAs only seem to communicate with their residents on this only when there is an enormous change in collections about to start – ie years without information in between – and then they can claim how much more more successful the new system is – just to score a political point!! Many boroughs in London have compulsory recycling – not to zero waste level – but so that everyone is expected to sort some of the RESOURCES out of their rubbish so that they are not wasted. I believe that most councils have systems where they can help those people who haven’t done this to start rather than penalising them – by identifying them and providing the correct containers. Don’t most councils give you warnings and the option of finding the information and ordering containers 24 hrs a day now on the internet? Admittedly that doesn’t help everybody to help themselves – but there is no reason why one neighbour cannot help another. You don’t help by tiptoeing through the rat-picked, cat-picked, magpie-picked and fox-picked remnants of your neighbour’s dinners and other unmentionables strewn from their torn black sack left on the street and pretending not to notice! I fear that bin fines will lead to more fly tipping. I understand that Dublin had (probably still has) a problem with this when the local authority started to ration/weigh how much rubbish they would collect and make you pay for the extra on the basis that you were not recycling enough. Something along these lines anyway. Result: even more rubbish in the countryside. So how do you persuade people to look further and think further than their nose? Anyone who can tell the difference between their socks and their knickers can recycle. Logically we should pay much more for packaged food and other goods so that we can be rewarded when we separate and return the packaging for reuse and recycling, We don’t. Truthfully there are too many self-centred people out there who just can’t be bothered; and unless there is a fine and compulsory recycling they won’t consider doing anything. Why should everyone else and the environment pay? There are too many pathetic excuses about it being difficult. All this dumbing down is unnecessary. It is just an avoidance tactic. Get the right info out there, offer advice and guidance and if after warnings and help no attempt is made then further action needs to be taken. Some Councils have asked their residents whether they think (some) recycling should be compulsory and they have voted ‘Yes’. Residents have been quoted as saying that they were surprised how easy it is once they have been kick-started into doing it! Why not reduce the amount of Landfill Tax your Council has to pay thereby increasing the amount available to spend on other services – eg those needed by the truly vulnerable? This proposed change to the legislation is penalising all the Councils who are using the legislation correctly and have had great results. In Leicester it is used with the Fire Service as they were having problems with arson attacts on the bins which has resulted in houses catching fire, the removal of the bins off the street has reduced arson and also reduced costs to the Council, police and fire service. It has also helped those who are disabled and with visual impairments who are not able to use the streets due to the bins obstructing the pavements. Fining people, unless really, really persistent is not the answer. Education is part of the answer. A key factor in my view is that the onus is always on the consumer to re-cycle, but there seems less focus and compulsion on industry and the supermarkets to ensure that packaging is minimal and if it is used at all, that it is easily re-cycleable. Increasing trend in supermarkets for everything to be packaged to make handling and processing simpler for them (but not cheaper for us as someone has to pay for the packaging). They will say it protects delicate products. But most of the plastic packaging is not recyclable – it should be. Much plastic is marked as re-cycleable with a code 5. Do any councils actually re-cycle it. Is it re-cycled in other countries? Why are plastic carriers still being issued by shops. Can we have paper bags instead of plastic ones to put fruit and veg in? I usually put it loose in the trolly which of course slows the paying process, but preferable to that plastic bag getting into the ocean and being eaten by a turtle in mistake for a jelly fish. The whole subject is a mess and needs radical improvement, ensuring that the consumer is not blamed and is regarded as but one part of a whole chain of people, companies etc. involved in the re-cycling process. Nice article. I have written about many of those points myself. I agree that education is the answer. However that may not be education of the residents but education of those in the Council. The information has to get out to the residents. However Councils need to be able to answer residents’ questions. They also need to know what their contract is in order to answer questions. They also have to have good and clear information on their websites available 24/7 and publicize that this is there, as well as other publicity eg on the bring banks in the street and on the noticeboards that they rent out to everybody else. The people they employ to go around from door to door (after winning a grant from WRAP or defra or whatever – they need extra money for this) often don’t live in the borough and don’t recycle themselves. It is treated as a sort of fire-fighting exercise. There is often no publicity campaign for years and then a change in the system with a great campaign and the current political party will then claim that there is an enormous increase in the recycling percentage rate and aren’t they so successful! For years before a change in contract they do sweet nothing – don’t even update the info on Recycle Now. Those door to door type campaigners should take details of people’s questions if they can’t answer them to find an answer from someone who can. One of the greatest successes in this has to be re-ordering of containers for people. Only neighbours could also do this if they talk to new neighbours before they start to feel aggrieved at walking through their waste on the pavement – or alert the Council’s Recycling Department to new tenants who may need help so that the Council can call or send information and make sure that they have the right bags and bins. We must all stop pretending we don’t see the mess of torn bags on the pavement and overflowing bins left out too early. We have transient populations. Recycling isn’t difficult. Sometimes finding the information and equipment is. I would love to see magazines showing kitchens with the food waste bins built in. I know people who have done this. Also food disposal machines in the sinks of flats where there is not enough amenity space for a food waste bin. I understand that Thames Water no longer object to these however they may not be a good idea for flats with old pipework.